"If you like fresh peaches, this is the pie for you. It's the only way my family wants it. It's delicious topped with whipped topping." In a saucepan over medium heat, combine sugar and cornstarch. Add water and bring to a boil. Continue to boil or 3 minutes, stirring constantly. Stir in the peach gelatin mix. Remove from heat and allow to cool. In a large bowl, combine the sliced peaches with the gelatin mixture. Gently stir until peach slices are coated with gelatin. Pour into baked pie shells. Refrigerate until set. It was pretty sugery so I would cut that down. I would also do more peaches and less glaze. Pretty good taste however. This is a wonderful way to use fresh peaches. It's also a cool summertime dessert that almost prepares itself. It was the best way to use the peaches we bought in our trip to Georgia. The recipe is good and easy. This is the best fresh peach pie I have ever made. As soon as I make them, they are gone, my whole family loves the fresh peach taste. 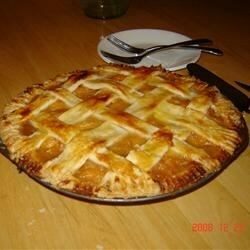 Great Peach Pie. Recipe only made one pie though. I only used 1/3 cup sugar and a large box of sugar free peach jello. Turned out a bit stiff but fantastic for an extremely low sugar dessert!